This summer, one of Fridley High School’s own rose to the most prominent position of an international service group. Senior Emily Rice was chosen as International President of Key Club International at the program’s annual convention in Chicago on July 7, 2018. The role oversees more than 264,000 members from 5008 clubs in 38 countries around the world. Key Club is a student-led community service organization focusing on servant leadership and building leadership skills. It is sponsored by Kiwanis International through local districts and international entities. Rice found out she was one of two finalists for International President after a day of caucusing and attending a morning nominating conference, giving numerous speeches throughout. On the afternoon of July 7th, Rice won the election. The International Board focuses on strategies, making decisions for the organization as a whole, and providing grants and fundraising opportunities. The board also looks for ways to improve the member experience and create a sense of community within the organization. Rice was an international trustee last year, so she was familiar with how the board operates. A personal goal of hers is to boost the international focus instead of local club level support. “My campaign was based on the tagline ‘let’s focus on who makes this organization as great as it is: our members, our supporters and our communities,” she said. Her new role involves a fair amount of travel for a high school senior. “I just got back from Indianapolis – I was there for nine days for training and a board meeting. I’ll be returning there in November, and Baltimore for another board meeting. Beyond that, it’s on a request basis, with the international president averaging one trip per month, and one international trip,” Rice said. 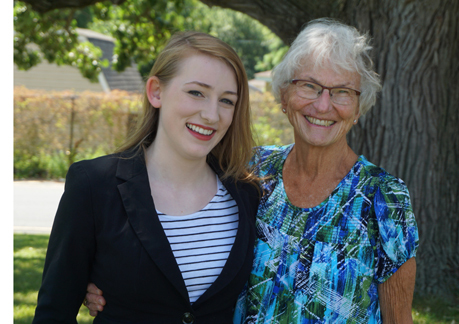 Kiwanis sponsor and Key Club advisor Mary Bowen has watched Rice’s ambition over the years, and felt she was destined for great things. For the 16th straight year, Fridley’s Key Club has achieved the rank of Distinguished Club - Diamond Level, the only club in the Minnesota-Dakotas District to achieve the designation and an achievement that puts them in the top one percent of clubs. To attain this honor, Key Club partners with the Fridley Kiwanis group to raise awareness and donations for such organizations as UNICEF, Children’s Miracle Network, and the March of Dimes. Fridley’s Key Club ventured into service projects, such a cleaning the football field after home games, taking May baskets to nursing homes, teacher appreciation tokens, and making pillow case dresses and dolls for 15 orphanages in Africa. The group also held its annual 72-hour teeter totter marathon at Bowen’s home to raise money for Eliminate, a Kiwanis project group that funds neonatal and maternal tetanus vaccines in third world countries. One of its most visible campaigns is its annual Socktober Sleepout, a month-long effort to collect socks for homeless people and includes club members sleeping in cardboard boxes on the football field for a night. Bowen figures the Fridley Key Club has raised between $20-22,000 over the years through its fundraising efforts. 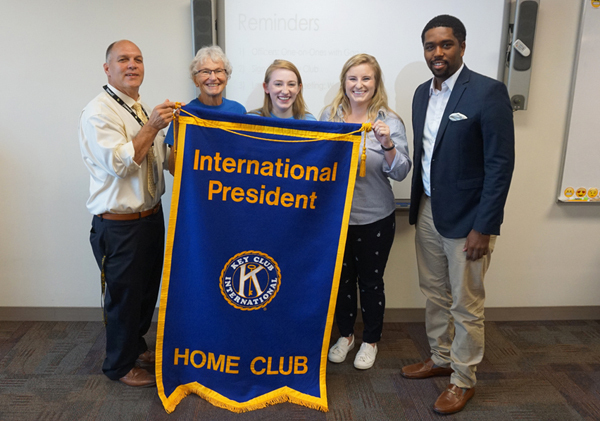 Greg Stowers, the Director of Key Club International, made a visit to Fridley High School on September 12, 2018, to meet the club that has won the prestigious Diamond Level for a record 16-years in a row. In addition, he joined Rice in presenting a banner to Activities Director Dan Roff, proclaiming the high school as the home club of the International President.